If you have an impressive wine collection, with nowhere to store the bottles, this is a clever space-saving solution that's as practical as it is attractive. The freestanding design means it'll be a stylish addition to any kitchen countertop or home bar. Whether you enjoy the red wine, white wine or sparkling variety, create an immaculate display with this stand. Designed in house by VonShef, the geometric pattern is the influence of modern minimalist trends, while the metallic brushed gold finish adds a touch of luxury and elegance. Strong steel frame is designed to hold up to 8 bottles in a strategic formation that means it's equally as attractive full - as it is empty. Create an impressive display with multiple racks to cater for more wine bottles. Lay them out side by side to create an attractive wine wall. Easy to maintain - simply wipe down with a damp cloth to remove dust. 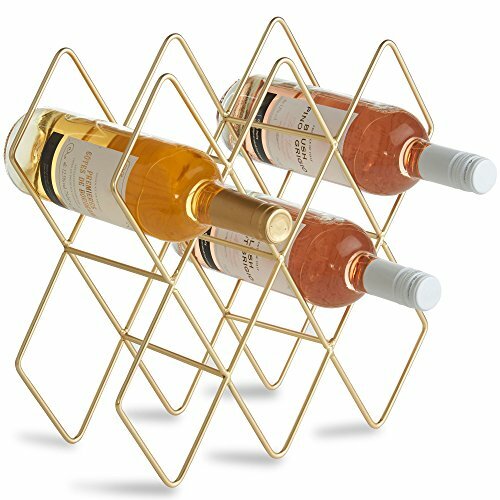 STYLISH DESIGN: Distinctive gold color and minimalist geometric design make this wine rack worthy of being on display in the kitchen, dining room or bar area. STRONG STAINLESS STEEL: Frame in a brushed gold finish is both practical and modern.